Beautiful apartment that used to be an artist atelier where lived in diferent times 3 genereation or artists such as the Futurist painter Gino Severini, the sculptor Nino Franchina and film director Sandro Franchina. The apartment is 100m from Place denfert Rochereau, where you'll find all the public transports suche as buses, subway and RER. Not far from train station Montparnasse, from the famous pedestrian Rue Draguerre, full of restaurants and shops and from Fondation Cartier of contemporary Art on Boulevard Raspail at the corner of Rue Schoelcher. With its ceiling of 5m high, large library, chairs, chest of drawer, sofa bed, TV, CD player, VCR, large windows, stairs leading to the upper floor. With antique bathtub and shower, antique sink, antique bidet, antique wc, ( dating from the the restructuring of the building) ventilation system, window facing inner courtyard, iron. Central heating, boiler of 150l, CD & DVD player, VCR, TV , washing machine , kettle, multi-function robot, squeezer, microwave,iron, reinforced door, elevator, WiFi. PLEASE NOTE : No smoking. This was our return trip to the apartment having really enjoyed staying here the previous year. Michelle was once again a friendly, helpful contact who was courteous and assisted us when there were a few emergency repairs to be made to the property; her kindness and attention helped make the stay an enjoyable one. The apartment itself needs some love and attention, most especially with painting the walls and fixing some parts of the bathroom. However the charm of the place is its size and the peaceful neighbourhood, with the whole of central Paris in easy reach but a safe and snug nest to come home to each evening. The Rue Daguerre is a wonderful place for fresh food and drink, and there are some nice restaurants nearby too. With a bit of time and energy spent aesthetically improving the apartment, this would be a reach catch for a full-week stay! Loved it! Stayed with two kids. Shopping is convenient, as is transportation. Lovely appartment. Made for a perfect launch pad for our excursions into Paris. it could definitely do with some paint, but it was charmant! Sorry it took me so long to reply, we continued our tour in Barcelona, and then back in Canada I was on another project, a 2week intensive research period. Anyhow, here is my feedback for our stay at your apartment. The place is lively, clean and well equipped. We were welcome by a very nice and kind woman, and anytime we had question (email, phone) we received instant help and feedback. The neighbourhood is quiet and close to everything. I would recommend this place to my friends and fellow artists going to Paris, and hope we'll get a chance to come again in the future! The apartment was really very interesting. We spent a good deal of time working out the Severini/Franchina family tree from the books and memorabilia in the flat. It was ideal for two adults and two children. Close to the Metro and buses and many shops, cafes and restaurants closeby. Great spot in Paris. We all enjoyed the 2 person (at a push!) lift and the building felt safe and secure, and quiet. A beautiful artist's studio in Paris, furnished with a stylish retrò mood, plenty of light and colour. There are still some of the objects the artist used! At only 20 minutes from Orly Airport, it's the perfect location to move easily around the city either on foot, by bus or metro (we've done all!). Really close by is a lovely and lively street, rue Daguerre, with the market, shops and restaurants. We really felt at home, the house was very clean and cosy. 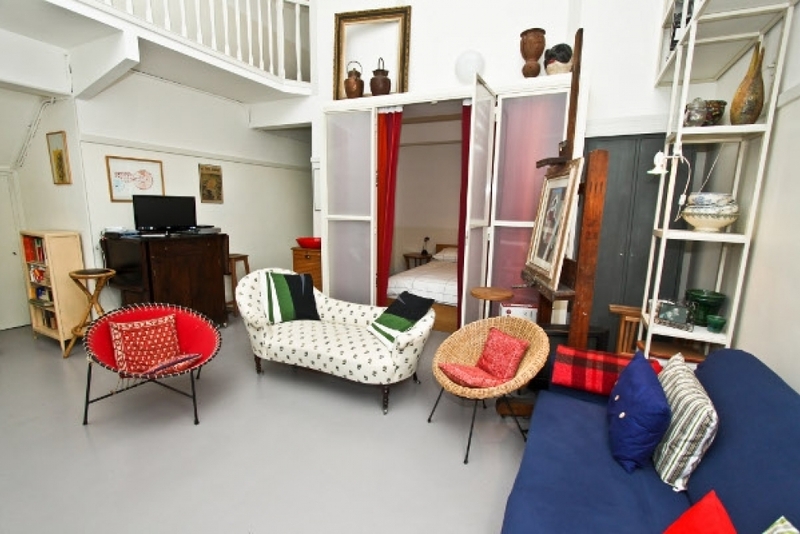 Location in Paris is great - near Metro, RER, shops etc. There was only 2 of us so plenty of room. Apartment needs some work - bathroom plumbing needs some work and apartment needs painting throughout but apparently this is being done soon. Quiet, safe neighbourhood. Would stay there again. Not good if stairs are a problem. Mikaela (from citiesreference) was extremely helpful. A very spacious and convenient apartment in a relatively quiet - but well connected - part of Paris. It could do with a lick of paint, but everything is in great working order and it became quite a home-from-home over the week we were there. The Rue Daguerre around the corner was lovely! We thoroughly enjoyed our stay in this apartment in Paris for a week. It was light, quiet and the location in the 14e was convenient to trains, bike paths and a Velib station, and even the Foundation Cartier at the end of the block. We especially loved having the markets nearby on Rue Daguerre and the weekly market on the nearby park. We appreciated the apartment 's own unique charm- which retains the feel of being a personal artist's studio- though it is a bit worn, with ripped upholstery and chipping paint, which may be a concern for young familes, and a toilet that unfortunately does not work as efficiently as one would like. Still we would recommend it to visitors who can enjoy its casual, relaxing space as we did. 2 adults + 2 children having a wonderfull holiday in this special appartment in Paris. All you need in the kitchen. Good sleeps and lots of places nearby for shopping your daily needs. Parking was possible on the road but we left our car at Park A - Rue de Renne. Booking via http://www.neoparking.com gave us a 66% discount. Very nice, open apartment in Paris. Very good location and lots of pubs, bakerys and supermarkets close by. We really enjoyed our stay!! This accommodation in Paris was excellent. We were met on time and shown how everything worked which was good since the apartment is quirky given its age and original features. The big windows make it very bright and welcoming. I would happily return here. An ideal flat in Paris for the artistic or boho family. An ecliptic mix of vintage and Ikea with a bit of peeling paint. The flat and the surrounding area felt very safe. We felt as if we were living as local people rather than tourists. The location is fantastic and so easy to get to the airport and the major attractions. The flat is very quiet thanks to overlooking a large graveyard which was a real bonus in a busy city. Fabulous food shops near by and easy to eat really well and use the kitchen rather than eat out which is expensive by comparison. Our family of 4 stayed 10 nights. There was plenty of room , the kids (10 and 12 ) had their own bedroom . Must mention the beds were very comfortable , unlike some other apartments. Location is fantastic, close to metro , restaurants, supermarket . We were even able to walk to Sienna although this depends how far can one walk. Michelle, the lady who greeted us was exceptionally nice and helpful. We would stay in this apartment again and recommend it highly. Great choice! The area is fantastic: a quiet neighbourhood with all the required services (shops, cafes, library, phramacy...) and two subway stops within 5 minutes' walk. If you arrive at Orly Airport the Orlybus takes you staright into Denfer Rochereau station in 20 mins, only a few minutes away from the apartment. Completely equipped, of courser there are a couple of hitches (poor bathroom lights, eg) due to the age of the building, but a more modern atmosphere wouldn't be so charming. Perfect apartment for our stay in Paris. Well situated - near the metro, shopping and restaurants. Excellent welcome from our contact and the apartment was very clean. We would stay here again. I've stayed here twice now. Great location with wonderful food shopping on Rue Daguerre two blocks away and just a little further to Denfert Rochereau metro and RER station. Apartment is very well equipped with voltage transformer (for your 110v appliances -- useful for charging my electrc razor), all kinds of kitchen equipment, a washing machine and clothes-hanging-dryer system above the bath tub. Bath and shower work well. Place was clean upon arrival. Two negatives: 1) fold out sofa bed in living room is quite uncomfortable with a 5 degree tilt leaving head side lower than feet side. 2) the main negative and reason did not get 5 stars: the toilet is highly inadequate. It has trouble flushing down solid waste. Sometimes it would go, but sometimes it wouldn't go until after it had sat in there for a couple hours. Really not good. If it were my place I would replace the old-fashioned toilet and get one with a modern design. Michelle checked us in and was very helpful, friendly, and tried her best to get the toilet problem solved. Owner Comments: Hi Lloyd, terribly sorry about the toilet problem, it is our first priority to fix it will get done by the end of the month. Our most sincere apologies and thanks for your feedback and repeat business, we really hope to be working with you again! The apartment is nice, well located in Montparnasse where many restaurants, coffeehouses and shops are. We felt at home there. The only drawback was that we were woken up at 7.30 nearly every morning because of renevations in the apartment next door. The area seems safe and the building as well. We loved, loved, loved the apartment and would like to rent it again for the same week in January next year. Beautiful apartment! Unforgettable, Charming experience! Totally recommended. Wonderful apartment! Excellent location, just two blocks from the Metro and RER train lines. 10-minute ride to the heart of Paris. One block from a wonderful street market. Neighborhood felt very safe. Plenty of space to spread out, very airy with lots of natural light. Sound-proof bedroom for a great night's sleep. Small kitchen with all the amenities to fix a quick breakfast or even a full dinner. It was very helpful to have a washing machine (though no dryer). Highly recommend! !